Each county in Hawaii has a slightly different approach to Tax Relief programs and exemptions. 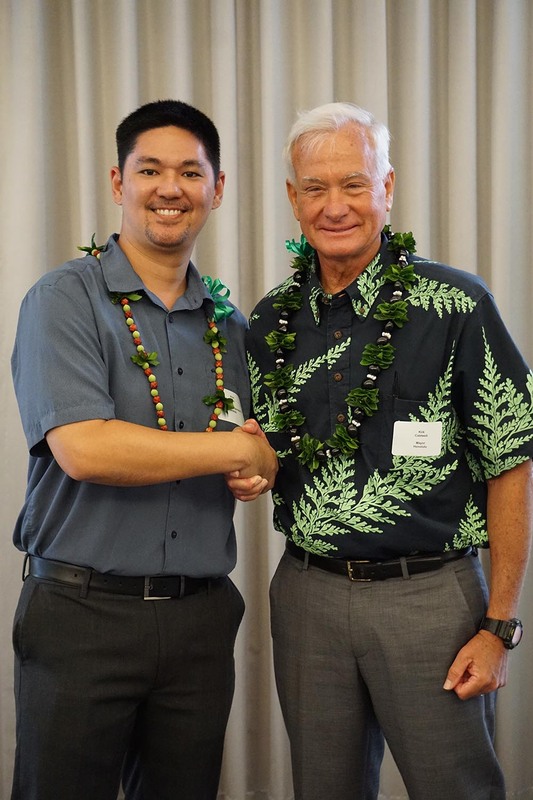 I recently attended the 2017 Board of Review Conference on Oahu with Mayor Arakawa and two Board members from the Real Property Tax Review Board on Maui. 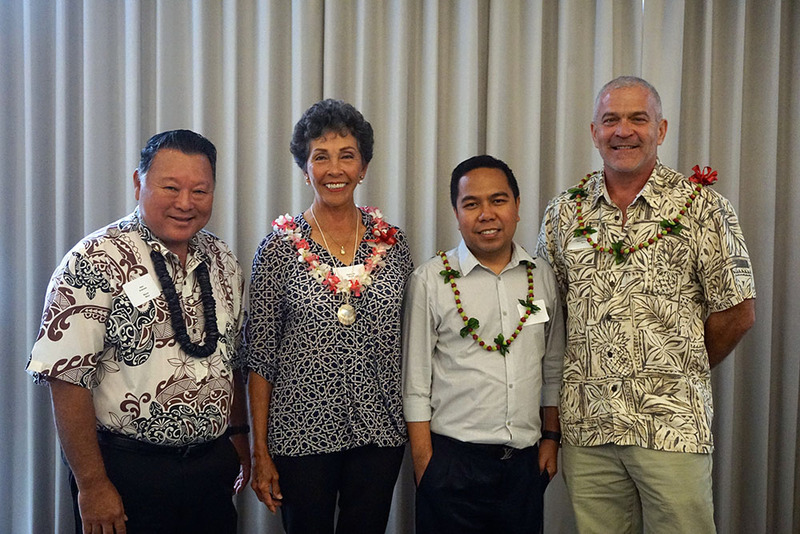 The Maui board is made up of 5 members appointed by the Mayor for a 5 year term. I’m in my second year serving on the Board. 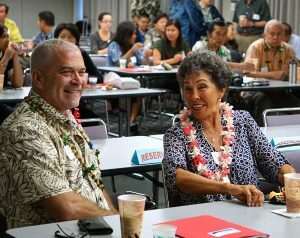 The conference included Mayor Arakawa and Mayor Caldwell, Board members, tax assessors, appraisers and staff from each County’s Real Property Tax Division. The Real Property Tax Review Boards hear appeals brought by tax payers to dispute their real property tax assessments, valuations, exemptions, and circuit breakers. The conference is held each year to start off the tax appeal season and discuss important issues relating to property taxes. Fusao Nishibun is the Tax Relief Section Supervisor for the City and County of Honolulu and gave a presentation on County Tax Relief programs. Tax relief programs (also know as circuit breakers) are available to help those Homeowners in our community that need assistance to stay in their homes while property values and taxes are increasing. There are different programs available depending on which county you live in. It’s interesting to note that only Hawaii island does not have a tax relief program. 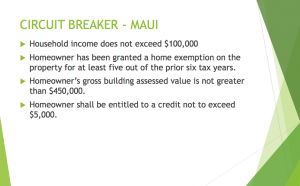 Maui – Homeowner shall be entitled to a credit in the amount that the real property tax calculated for the homeowner property for the prior tax year that exceeds 2% of household income. Household income can not exceed $100,000 and the homeowner has been granted a home exemption on the property for at least five out of the prior six tax years. The Homeowner’s gross building assessed value can not be greater than $450,000. The Homeowner shall be entitled to a credit not to exceed $5,000. 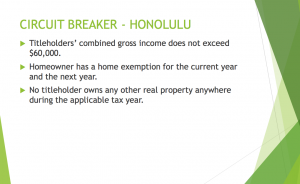 City and County of Honolulu – Qualified homeowner shall be entitled to a tax credit equal to the amount of taxes owed for the current tax year that exceeds 3% of the titleholders’ gross income. Titleholders’ combined gross income can not exceed $60,000. The Homeowner has a home exemption for the current year and the next year. No titleholder owns any other real property anywhere during the applicable tax year. 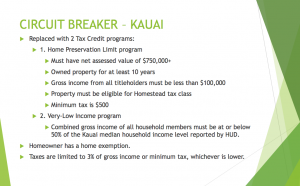 Kauai – 2 Tax Credit programs: 1. Home Preservation Limit program Must have net assessed value of $750,000+. Taxpayer has owned property for at least 10 years. Gross income from all titleholders must be less than $100,000. 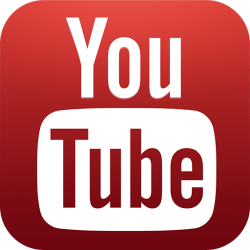 Property must be eligible for Homestead tax class. Minimum tax is $500 2. Very-Low Income program. 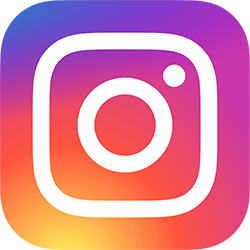 Combined gross income of all household members must be at or below 50% of the Kauai median household income level reported by HUD. Homeowner has a home exemption. 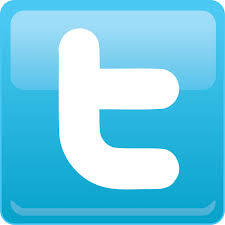 Taxes are limited to 3% of gross income or minimum tax, whichever is lower. There are programs available for those in our community with limited income and disabilities to stay in their homes by providing tax relief.